Sometimes, an item or structure that is mass-produced and entails a “one-size-fits-all” approach fits what you need. Oftentimes, it does not. Each person has different things they look for in a product, and trying to find an item that best suits your needs can be difficult and time consuming. As a general rule of thumb, the more options a consumer has, the happier they will be with their product. For example, a “one-size-fits-all” hat may not properly fit on the heads of everyone who purchases it. However, if that hat is available in an assortment of sizes, the consumer is more likely to find a hat that properly rests on their head, and thus will be more satisfied with their transaction. As straightforward as this example is, this line of thinking best describes why Deer Creek Structures offer a myriad of customizable options to our customers. We understand that what served as a perfect portable barn for a customer in Texas may not perfectly suit a customer in Ohio. All of our customers essentially have limitless options when it comes to customizing a portable barn, a portable rustic cabin, portable sheds and portable playhouses. We make sure that you will have enough room to house your animals or have an area spacious enough to accomplish your goals in a cabin. Deer Creek Stable’s portable horse barns are not limited to just horse shelters. 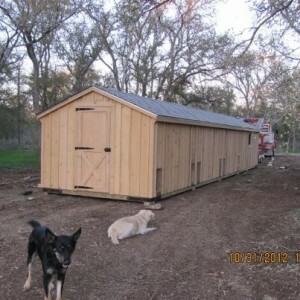 Below is a picture of a recently completed customized barn that we constructed for a customer. The barn was designed to be a 12-kennel doghouse, complimented with a storage area at the end of the barn. Deer Creek Structures can design a barn for any type of livestock, be it donkeys, goats horses, dogs or any other animal. The options are always endless when you choose a company that does not employ the “one-size-fits- all” approach to its customers!